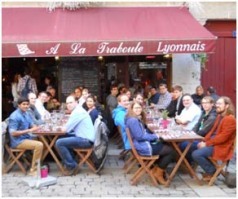 The PhD student workshop of the EFCE Working Party on Polymer Reaction Engineering (WPPRE) represents an international platform where young academics in the field of Polymer Reaction Engineering can build up valuable networks. It is an opportunity to meet fellow PhD students and to get in contact with representatives from industry. In 2012 Professor Dr. Markus Busch from the Technical University of Darmstadt took over the chair of the WPPRE. Since then four workshops have been organized (’12 in Lyon, ’13 in Hamburg, ’14 in San Sebastian, '15 in Fürstenfeldbruck, '16 in Hamburg, '17 in Vienna, and '18 in Prague). They have been primarily directed to PhD students from universities all over Europe, giving them a chance to talk about the latest results of their work by means of short oral and poster presentations. In return they were able to benefit from helpful feedback and suggestions of the audience. For the future we would like to perpetuate the workshop as an annual event and by that establish a continuous scientific exchange between research groups on Polymer Reaction Engineering. The upcoming WPPRE workshop is scheduled from 14 to 16 June 2019 and takes place in Hamburg, Germany. This of course also includes know-how of analytical methods and techniques for medium and high pressures. Besides the hard work to be invested in the poster and oral presentations there will be time for intercultural exchange on a more private basis. The last two years lunch and dinner was kindly sponsored by industry giving the participants the possibility to get to know each other in a relaxed atmosphere. Furthermore one day of the workshop is reserved for the closing ceremony and a joint activity in which one gets to see a little bit of the hosting city. On the left: Lunch break in Lyon - enjoying the local cuisine. 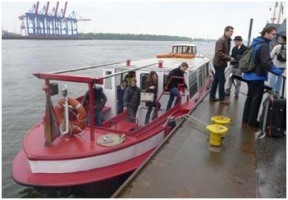 On the right: Boat tour through the harbor in Hamburg. Download the FIRST ANNOUNCEMENT here! The registration fee is 100 EUR. It covers the attendance, course material and the participation in the social events. After you have registered and been accepted for a workshop contribution, you will receive a personalized invoice.